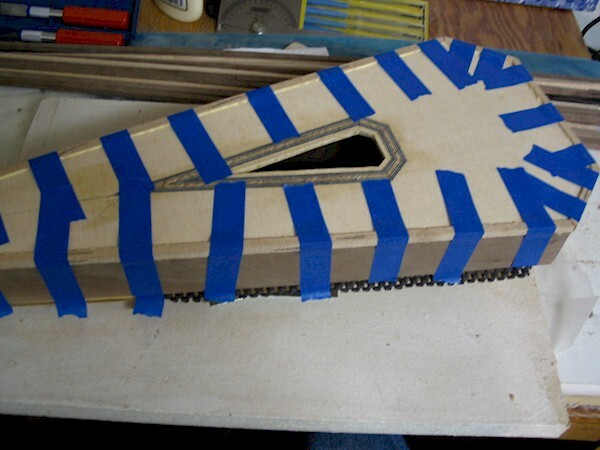 Here you can see how the trim that borders the top and bottom of the psaltery (also called the “binding”) gets attached. 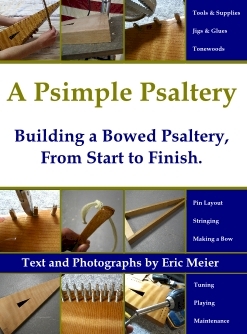 The psaltery in the picture is a spruce top, with walnut back and sides, and hard maple binding. You can clearly see the blue masking tape contrasting with the wood. Pulled tight in both directions, the tape does a good job of holding the binding in the slot until the glue dries. Gluing binding can be a tricky endeavor because you need adequate pressure in two directions—both downward and sideways pressure simultaneously. Low tack masking tape is used to avoid damaging the wood surface when the tape is removed. Also, I intentionally make the binding a bit over-sized and then route/sand it flush with the surface of the psaltery afterward.